Cars these days last so much longer than they used to, and it’s quite common to see vehicles that are 10 or even 15 years old on the road. That’s great from a value perspective, but there have been plenty of advancements in the automotive industry over the past decade. Needless to say, older cars often cannot take advantage of all these great new features — but there’s one feature that any car can take advantage of, and it’ll barely cost you any money at all. 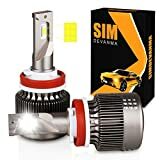 The Simdevanma LED Automobile Headlight Conversion Kit adds bright, modern LED headlight bulbs to just about any car on the planet. And it’s not and older HID headlight kit, so you can install it yourself in minutes. The result will be a huge upgrade in visibility, making your car much safer to drive. And yeah, they look pretty awesome, too. $50 is a great price for this kit, but use the coupon code OMUOP75W at checkout and they’ll only cost $24.95. The coupon is good for all bulb sizes so it works with any car, new or old. This deal expires on Thursday so take advantage of this deal while you still can! Simple design, Supports Plug In Play for smooth installation. The installation process is very quick and will take about 15 – 20 minutes. Lumens: 8,000LM/set(4,000LM per bulb),White light 6,000K,80W/set(40W per bulb). 320°Led headlights without any missed spots or dark areas. The LED bulb lifespan is over 50,000 hours. The Led headlight bulbs are waterproof! There are also strong fans to keep the led bulbs cool at all times. Save on replacing regular headlight bulbs. Street legal and DOT approved .Shipped from the USA with 2 years of manufacturer warranty on parts and labor.Please note 2007+Dodge, Chrysler, Jeep, BMW, Mercedes-Benz vehicles maybe requires led canbus to prevent dashboard/flickering .Some of vehicles could not install these properly because back cover/dust cover ,you maybe need to get exclusive dust cover from Simdevanma.